Driven by the ongoing digital revolution and demographic, political and social forces, almost 90 percent of HR and business leaders rate building the organization of the future as their highest priority. In its 2017 Global Human Capital Trends report, "Rewriting the rules for the digital age," Deloitte issues a call-to-action for companies to completely reconsider their organizational structure, talent and HR strategies to keep pace with digital disruption. "Technology is advancing at an unprecedented rate and these innovations have completely transformed the way we live, work and communicate," said Josh Bersin, principal and founder, Bersin by Deloitte, Deloitte Consulting LLP. "Ultimately, the digital world of work has changed the rules of business. Organizations should shift their entire mind-set and behaviors to ensure they can lead, organize, motivate, manage and engage the 21st century workforce, or risk being left behind." 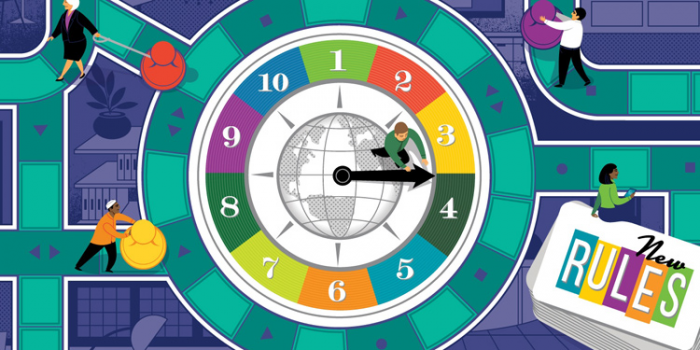 With more than 10,000 HR and business leaders in 140 countries weighing in, this is Deloitte's largest and most extensive Global Human Capital Trends survey to date. The hallmark study – in its fifth year – reveals that leaders are turning to new organization models, which highlight the networked nature of today's world of work. However, as business productivity often fails to keep pace with technological progress, Deloitte finds that HR is struggling to keep up, with only 35 percent of HR professionals rating their capabilities as "good" or "excellent." "As technology, artificial intelligence and robotics transform business models and work, companies should start to rethink their management practices and organizational models," said Brett Walsh, global human capital leader, Deloitte Global. "The future of work is driving the development of a set of 'new rules' that organizations should follow if they want to remain competitive." As the workforce evolves, organizations are focusing on networks of teams, and recruiting and developing the right people is more consequential than ever. Survey respondents point to talent acquisition as one of the biggest issues organizations face, with 81 percent of companies citing it as "very important" or "important." However, while Deloitte finds that cognitive technologies have helped leaders bring talent acquisition into the digital world, only 22 percent of survey respondents describe their companies as "excellent" at building a differentiated employee experience once talent is acquired. In fact, the gap between talent acquisition's importance and the ability to meet the need increased by 14 percentage points over the last year. It is critical to take an integrated approach to building the employee experience, with a large part of it centering on "careers and learning," which rose to second place on HRs' and business leaders' priority lists, with 83 percent of those surveyed ranking it as "important" or "very important." Deloitte finds that as organizations shed legacy systems and dismantle yesterday's hierarchies, it's important to place a higher premium on implementing immersive learning experiences to develop leaders who can thrive in today's digital world and appeal to diverse workforce needs. The importance of leadership as a driver of the employee experience remains strong, as the percentage of companies with experiential programs for leaders rose nearly 20 percentage points from 47 percent in 2015 to 64 percent this year. Deloitte believes there is still a crucial need, however, for stronger and different types of leaders, particularly as today's business world demands those who demonstrate more agile and digital capabilities. As organizations become more digital, leaders should consider disruptive technologies for every aspect of their human capital needs. Deloitte finds that 56 percent of companies are redesigning their HR programs to leverage digital and mobile tools, and 33 percent are already using some form of AI applications to deliver HR solutions. "HR and other business leaders tell us that they are being asked to create a digital workplace in order to become an 'organization of the future,'" said Erica Volini, principal, Deloitte Consulting LLP, and national managing director of the U.S. human capital practice. "To rewrite the rules on a broad scale, HR should play a leading role in helping the company redesign the organization by bringing digital technologies to both the workforce and to the HR organization itself." The trends in this year's report show signs of reinvention on all fronts, including jobs themselves. Organizations should approach external talent, robotics, cognitive tools, and AI systems as the "new, augmented workforce." This year, 41 percent of respondents reported having fully implemented or having made significant progress in adopting cognitive and AI technologies within their workforce. But, only 17 percent of global executives report they are ready to manage a workforce with people, robots and AI working side by side – the lowest readiness level for a trend in the five years of the Global Human Capital Trends survey. While many jobs are being reinvented through technology and some tasks are being automated, Deloitte's research shows that the essentially human aspects of work – such as empathy, communication and problem solving – are becoming more important than ever. "This represents one of the biggest opportunities for the HR organization," said Volini. "To be able to rewrite the rules, HR needs to prove it has the insights and capabilities to successfully play outside the lines." To learn more about 2017 Global Human Capital Trends, view Deloitte's full report.